The term “endosalpingiosis” refers to the heterotopical presence of fallopian tube-like epithelium in ectopic location. It is derived from the Müllerian system and is usually located on the serosal aspect of the female genital tract. Most of the reported cases of endosalpingiosis were described in the pelvic and lower abdominal peritoneum. Colon, bladder, small and large intestine (especially appendix), umbilicus, paraaortic, and pelvic lymph nodes are the other sites specified in different case reports.,, Nonetheless, very rarely, it can present as a cystic mass in the serosal aspect of the fundus of the uterus (florid cystic endosalpingiosis). However, it is a benign entity which may be misdiagnosed as neoplastic cystic lesion due to its radiological resemblance and rarity of its occurrence. Solitary uterine myometrial location is rare, and only two documentations are reported in the literature., We present one such extremely rare case of cystic endosalpingiosis of uterine myometrium in a 42-year-old female along with brief review of the literature. A 42-year-old female presented with menorrhagia and occasional dull nonspecific pain in the lower abdomen. On presentation, the patient complained of weakness and examination revealed mild pallor. Her complete hemogram showed feature of nutritional anemia. Radiological evaluation showed hypertrophied myometrium with interspersed cystic cavities. Largest cyst measured 1.4 cm. A clinical diagnosis of cystic degeneration of leiomyoma was made and total abdominal hysterectomy with bilateral salpingo-oophorectomy was done. The uterus measured 8.5 cm × 7.5 cm × 5.5 cm. Outer surface was smooth while cut surface showed thickened myometrium with several cystic spaces within the myometrium. Few of the cysts were multiloculated and rests were uniloculated. Cysts range from 1.0–1.6 cm in size and contained clear fluid [Figure 1]a. Rest of the myometrium was unremarkable. Cervix measured 2.0 cm at external os and 4.8 cm in endocervical canal. Cut surface of the cervix showed few small cysts in the cervical stroma. Right-sided tube measured 3.0 cm in length and 0.3 cm in diameter. That sided ovary measured 3.8 cm × 2.5 cm × 2.1 cm. Left-sided tube measured 3.7 cm in length and 0.3 cm in diameter. Ovary of that side measured 3 cm × 2.3 cm × 1.8 cm. Cut surface of the right ovary showed few subcapsular cysts, largest measuring 0.2 cm in the largest dimension. Microscopy of the sections from the uterus showed proliferative phase endometrium [Figure 1]b. Myometrium showed several interconnected cystic spaces lined by ciliated columnar epithelium with basally placed peg cells, resembling tubal epithelium [Figure 1]c, [Figure 1]d No atypia or mitosis was seen in the lining epithelial cells. Sections from cervix were unremarkable except for presence of nabothian cyst. Right ovary showed hemorrhagic corpus luteal cyst. Contralateral ovary was histologically unremarkable. No evidence of malignancy was seen. The patient had an uneventful postoperative period, and at follow-up, the patient was asymptomatic. Endosalpingiosis was first described by Sampson in the year 1930. Most often, endosalpingiosis is asymptomatic and is incidentally discovered on microscopic examination. Sometimes, endosalpingiosis may present with nonspecific symptoms including menorrhagia, pelvic pain, hypermenorrhea, dysmenorrhea, or infertility., They have been found in association with endometriosis and uterine leiomyomas. Intramural endosalpingiosis is usually associated with subserosal endosalpingiosis and/or endosalpingiosis of other pelvic organs. It can sometimes be associated with serous neoplasms of the ovary. Solitary intramural endosalpingiosis without other associations is exceedingly rare. Only two prior case reports of exclusive intramural endosalpingiosis have been found after extensive search in the electronic databases., To the best of authors knowledge, this is the third case of purely uterine intramural cystic endosalpingiosis without a serosal component. 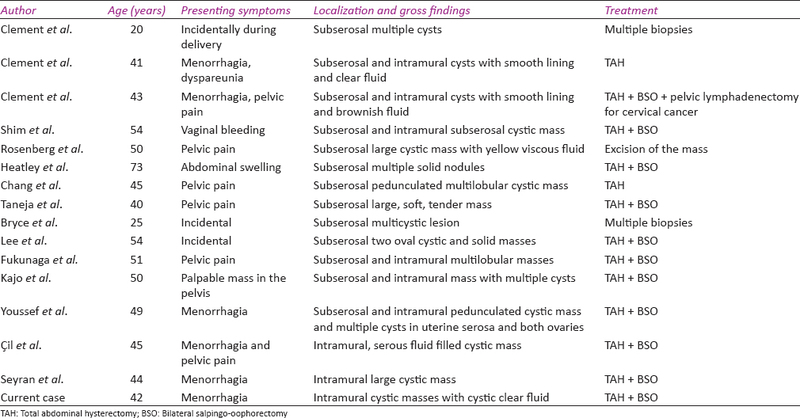 All cases of uterine endosalpingiosis including tumor-like lesion in the myometrium are enlisted in tabular format for completion of the review [Table 1]. The exact pathogenesis of endosalpingiosis is not known. However, it is postulated that it develops from the secondary Müllerian system. Another hypothesis centers around the possible mutation of Wnt pathways. The proliferation of these structures/Müllerianosis results in three different types of lesions as follows: endometriosis, endosalpingiosis, and endocervicosis. The pathogenesis of endosalpingiosis involves metaplasia of peritoneal pleuripotential coelomic epithelium into fallopian tube-like, ciliated, and low cuboidal epithelium. Intramyometrial endosalpingiosis is a rare entity with only a few radiological and histological differentials. Histologically, differential diagnosis of endosalpingiosis includes endometriosis from which it can be differentiated by the absence of plump celled endometrial stroma and/or stromal hemorrhage. The other differential diagnosis include endocervicosis (characterized by tall, columnar, mucin-secreting epithelium), florid deep glands in the uterine cervix (which show continuity with the uterine canal), multiple peritoneal inclusion cysts, or benign cystic mesothelioma. Radiologically, endosalpingiosis resembles cystic degeneration of uterine leiomyoma, congenital uterine cysts such as mesonephric and paramesonephric, cervical nabothian cyst, and intramyometrial hydrosalpinx. The presence of solid component surrounding the cyst helps in differentiating the discussed entity from others. To conclude, the lesion endosalpingiosis is indeed a rare entity and should be kept in mind in differentials of cystic intramyometrial lesions. The authors would like to thank Mr Debashis Goswami, Histotechnician, Health World Hospital, Durgapur, West Bengal. Clement PB, Young RH. 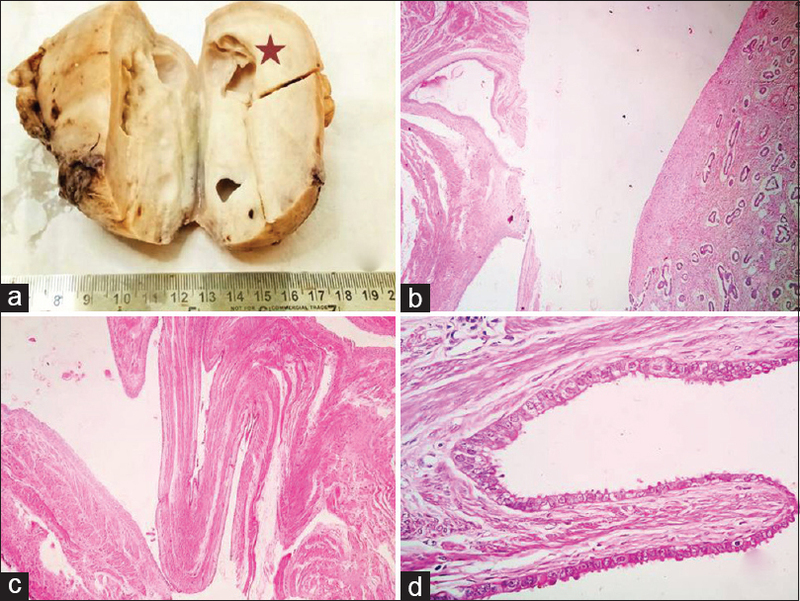 Florid cystic endosalpingiosis with tumor-like manifestations: A report of four cases including the first reported cases of transmural endosalpingiosis of the uterus. Am J Surg Pathol 1999;23:166-75. McCluggage WG, Clements WD. Endosalpingiosis of the colon and appendix. Histopathology 2001;39:645-6. Ong NC, Maher PJ, Pyman JM, Gordon S, Readman E. Endosalpingiosis, an unrecognized condition: Report and literature review. Gynecol Surg 2004;1:11-4. Papavramidis TS, Sapalidis K, Michalopoulos N, Karayannopoulou G, Cheva A, Papavramidis ST, et al. Umbilical endosalpingiosis: A case report. J Med Case Rep 2010;4:287. Rosen SH, Kim HS, Jo M, Tanjfukukajo SH, Kwak JE. Florid cystic endosalpingiosis of the uterus: A case report. Korean J Pathol 2008;42:189-91. Cil AP, Atasoy P, Kara SA. Myometrial involvement of tumor-like cystic endosalpingiosis: A rare entity. Ultrasound Obstet Gynecol 2008;32:106-10. Yığıt S, Dere Y, Yetımalar H, Etıt D. Tumor-like cystic endosalpingiosis in the myometrium: A case report and a review of the literature. Turk Patoloji Derg 2014;30:145-8. Sampson JA. Postsalpingectomy endometriosis (endosalpingiosis). Am J Obstet Gynecol 1930;20:443-80. Heinig J, Gottschalk I, Cirkel U, Diallo R. Endosalpingiosis-an underestimated cause of chronic pelvic pain or an accidental finding? A retrospective study of 16 cases. Eur J Obstet Gynecol Reprod Biol 2002;103:75-8. Santeusanio G, Ventura L, Partenzi A, Spagnoli LG, Kraus FT. Omental endosalpingiosis with endometrial-type stroma in a woman with extensive hemorrhagic pelvic endometriosis. Am J Clin Pathol 1999;111:248-51. Morales-Roselló J, Pamplona-Bueno L, Montero-Balaguer B, Desantes-Real D, Perales-Marín A. Florid cystic endosalpingiosis (Müllerianosis) in pregnancy. Case Rep Obstet Gynecol 2016;2016:8621570. Kajo K, Zúbor P, Macháleková K, Plank L, Visnovský J. Tumor-like manifestation of endosalpingiosis in uterus: A case report. Pathol Res Pract 2005;201:527-30.